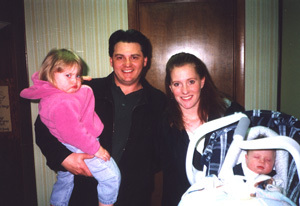 Joe and Heidi Panici with Brianna and Gino (asleep); his baptism is July 15, 2001. 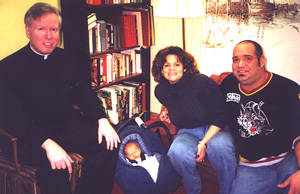 Jeffrey and Laura Carey Renzetti, with baby James. 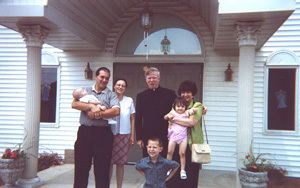 Steven and Kristy Poerio, with baby Anthony, on the day of baptism, June 9, 2001. 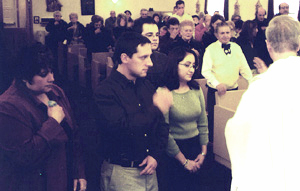 After instruction, several people professed their faith and were welcomed in the Catholic Church. Above, from the left, making the sign of the cross, are Cathy & Dave Hilgen, Mike Prisco, and Monica Garcia. In the pews, you can see Maria Planera and Frank Granno. After instruction and a catechumenate, Jon Niemi was baptized and confirmed. Here, in the same Mass, on Epiphany, he is receiving first Holy Communion. The minister is Sandra Ziccardi; the server is Nikko Rodriguez. Above, third from left, is Ray Thomas, who received both confirmation and First Holy Communion after extensive catechesis. Here, he is surrounded by his family. From the left are Rachel, Loretta Simentendi (grandmother), Ray, Marina, Jackie, Father Gilligan, Megan, Uncle Jaime, Aunt Rose Granno and Uncle Frank Granno. This celebration took place February 1, 2004. At San Rocco, catechesis of adults takes place as preparation for marriage, baptism, and profession of faith with First Holy Communion. Couples planning for marriage meet privately with the rector, if possible, with another couple or two; then they take part in one of the many programs offered by the Archdiocese of Chicago. Parents preparing to have their child or children baptized meet privately with the rector, at their convenience. Babies are baptized during Mass or apart from Mass, at the parents' choice. Most infant baptisms to date have taken place during Mass. It seems that people not only don't mind; they're happy to be involved. Those preparing for adult baptism would normally take part in the RCIA, the Rite of Christian Initiation for Adults; however, to date at San Rocco we have had only two persons, Jon Niemi and Paul Preuss, go through this process as such. For a time, they were catechumens, whom we prayed for publicly at Sunday Mass. They were also publicly given a Bible and a copy of the Creed. At the proper time, in the same celebration, they received all three sacraments of Christian initiation, in proper order: baptism, then confirmation, and then first Holy Communion. Such is the policy for the RCIA within the Archdiocese of Chicago and in the Roman Rite around the world. Those already baptized, preparing to become Catholic, do so in a group of eight to twelve people. In general, it takes about two or three months of weekly meetings, with some prayer, for people to be ready for confirmation and first Holy Communion. Some people need less time; some, more. 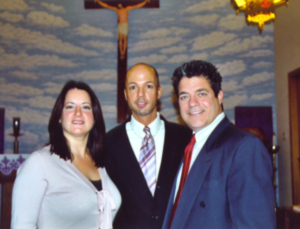 In 2001, only Jackie Petrelli finished and was welcomed into the Catholic communion by Cardinal George. 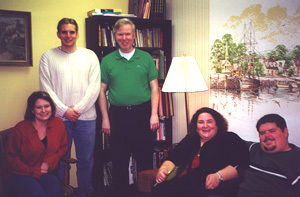 In 2003, Rose Granno, Dave Hilgen, and Monica Prisco were similarly welcomed on Holy Family Sunday. 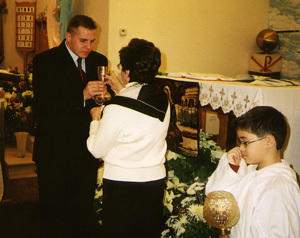 Jon Niemi was baptized, confirmed, and given First Holy Communion on January 4, 2004. Ray Thomas was confirmed and given First Holy Communion on February 1, 2004. 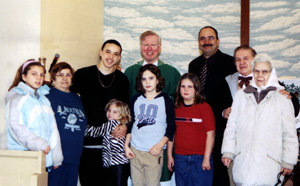 November 27, 2005, Paul Preuss completed his catechesis and was baptized, confirmed, and given First Holy Communion. We used two textbooks. The first was Outlines of the Catholic Faith, a question-and-answer booklet, something like the old Baltimore catechism. It's clear and tightly organized, with a useful appendix of familiar prayers. The second text, a better read, was The Complete Idiot's Guide to Catholicism, already in a second edition. This book, said the participants, was actually fun to read. The style is informal and direct, with clever illustrations and graphics. Some people in the group liked the book so much, they said, they couldn't put it down. In 2005, San Rocco Oratory had only one person studying the Catholic and Orthodox faith in this way: Paul Preuss. He started in March and became a catechumen on Sunday, October 9. For the next two months, the litany for the catechumens was sung at Sunday Mass, for his intention, before the litany of the faithful, the General Intercessions. From the Rite of Christian Intiation of Adults, there were also special prayers and exorcisms for the catechumen. On Sunday, December 4, the First Sunday of Advent, he was fully initiated, receiving the sacraments of baptism, confirmation, and First Holy Communion. Afterwards, his sponsor, Teresa Bravo, organized a reception in the San Rocco hall, on the east side of the parking lot. This hall is named after St. Anthony. 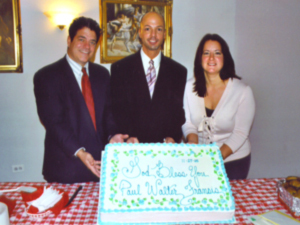 November 27, 2005: From the left are Teresa [Planera] Bravo, Paul Preuss, and his brother Kurt. This is immediately after the Mass celebrating Paul's baptism, confirmation, and First Communion. Here, again, are Kurt and Paul Preuss, with Theresa Bravo, over in the Hall named after St. Anthony. The cake was made for this occasion.